A supernatural thriller that spells out a completely logical explanation in black and white in its climax could be a bore. There are two other ways a film in the genre could work: either it could go all out and stubbornly refuse to offer or even suggest a rational clarification for the goings-on on screen; or it could leave enough room for us to read a logical explanation into the proceedings ourselves if we so choose. Full marks to debutant director Kannan Iyer for managing an uncommon blend of both in the pre-interval portion of Ek Thi Daayan. 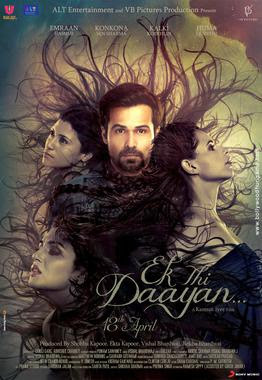 That he completely shuts out the possibility of a rationale in the last 15 minutes or so prevents this film from being as good as it could have been… but in the overall analysis, Ek Thi Daayan still has more scares and atmospherics than we’ve been getting in recent years from the cliché-ridden exponents of the horror/paranormal genre in Bollywood. The loveliest part of Ek Thi Daayan is the relationship between Bobo, his sister and widowed father. There is a particularly moving yet simple early scene in which the little girl matter-of-factly explains to her incredulous dad that she and Bobo took an elevator to hell which lies right beneath their building – the warmth and ease in their interaction is endearing beyond words. Of course, you tell yourself, when romance enters the father’s life it’s bound to cause some insecurity and jealousy in the children. It is these possibilities that keep the film intriguing and enjoyable for the most part despite an inconsistent screenplay. There are some niggling issues at the start though the first half of the film is written much better than the second half. For instance, I’d imagine a father who is so considerate towards his children would be a little more careful about the manner in which they discover his blossoming relationship with a new woman – this dad is not, nor does he make an iota of an effort to soften the blow when Bobo realises that he’s sleeping with the lady. Second, it grates the senses when details are treated lightly. Bobo’s opening act on stage has been shot at Kingdom of Dreams (KoD), a glitzy world-class entertainment destination in Delhi’s suburbs; the venue is even identified as KoD; but for some inexplicable reason a dialogue that follows seconds later suggests that the place is in Mumbai. No idea why. The stars of the film are its cinematography, art direction and low-key background score that conjure up an eerie sense of foreboding from Scene 1 minus any of the usual Bollywood horror film clichés of flying banshees, gore, white flowy garments, tantriks, padres, pandits or screeching sounds. Emraan Hashmi and child actor Vishesh Tiwari are amazingly consistent as the deeply disturbed Bobo of the present and the past. Tiwari was part of the Chillar Party cast that won 2012’s National Award for Best Child Artiste. This film is proof that Chillar was no flash in the pan for him. Equally remarkable is the little girl who plays Bobo’s sister. Huma Qureshi as Bobo’s fiancé Tamara does not get a role as well-fleshed-out as she did in Gangs of Wasseypur 1&2 but she’s interesting all the same. I have always loved Pavan Malhotra and Konkona Sen Sharma’s performances, but in that scene in which Bobo’s father (Malhotra) first begins to eye Diana (Sharma), he appears more lecherous than charmed. Sharma herself rolls her eyes in too exaggerated a fashion in at least a few places. On the other hand, there is Kalki Koechlin – the third female lead – displaying that natural ease before the camera that made her such a striking presence in Dev D. Her recent performances have tended to be one-toned but here, as she plays fast and loose with the audience (is she too a witch? is she not?) she reminds us of why she held out so much promise in her first film. I also love the way the director exploits her innocent smile and eyes to further the psychological games he is playing with us. Now if only the screenplay hadn’t lost its way in the denouement, if only it hadn’t turned so ordinarily literal and hence silly right at the end, this could have been a very nice film.As things stands, it’s not bad at all. Hope to see you again soon, Kannan Iyer. Oops! It's been a long day - I wrote the right names in the credits but the wrong names in the body text; corrected my mistake within seconds of uploading the post... but you were just too quick for me! :) Thanks for your alertness and sorry for my carelessness!